Is Polyunsaturated Fat Good or Bad for You? Polyunsaturated fats are dietary fats found in certain fish, nuts, seeds, and vegetable oils. A healthy fat, polyunsaturated fats can help reduce LDL cholesterol levels and lower your risk of heart disease and stroke. In addition to heart health, some polyunsaturated fats have been shown to promote brain health, improve mental-health conditions such as depression, prevent Alzheimer's disease. They may even aid in weight loss. Like all fat, polyunsaturated fat is calorie dense, with nine calories per gram, compared with four calories per gram of carbohydrate or protein. If you are counting calories or watching your weight, be mindful to not overindulge. Polyunsaturated fat is considered a "healthy fat" because it provides certain benefits to the body. But, like all fat, it is high in calories. So polyunsaturated fat foods should be consumed in moderation, especially if you are watching your weight. There are two main types of dietary fat: saturated fat and unsaturated fat. Unsaturated fats include monounsaturated fatty acids (MUFAs) and polyunsaturated fatty acids (PUFAs). What distinguishes these fats from one another is their chemical structure. Saturated fats have no double carbon bonds in their molecular structure and are "saturated" with hydrogen atoms. These are fats that are solid at room temperature, such as butter and lard. High intake of saturated fat has been linked to high levels of LDL cholesterol and heart disease. Unsaturated fats, on the other hand, have double carbon bonds. Those double bonds make unsaturated fat bendable, which is why they remain liquid, even in the refrigerator. Monounsaturated fats have one double carbon bond while polyunsaturated fats have multiple double bonds. According to the American Heart Association, swapping out saturated fat for monounsaturated or polyunsaturated fat can reduce LDL cholesterol levels and improve heart health. Saturated fats such as those found in meat and dairy products are generally solid at room temperature. While unsaturated fats are generally liquid, even when refrigerated. Polyunsaturated fats take on different forms, but the two most notable are the essential fatty acids omega-3 and omega-6. They are essential because the body cannot manufacture them, so they must be taken in through diet. 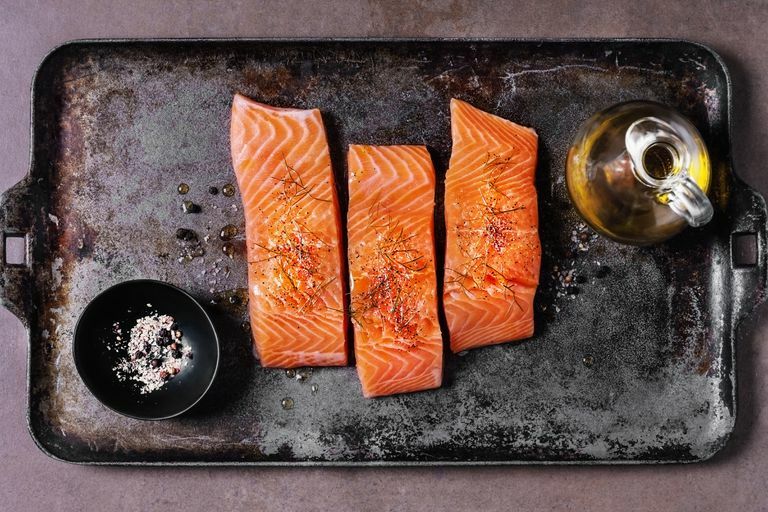 Omega-3 fatty acids are found in oily fish (such as salmon and trout), nuts, and seeds. Omega-3 fatty acids are generally favored among health experts because of the benefits that they may provide to the body. Many people take omega-3 fish oil supplements to ensure they get enough of these beneficial essential fats in their diet. However, it is not clear if taking the oil in supplement form provides the same benefit as consuming it naturally in food. Omega-6 fatty acids are found in some plant-based foods including nuts, seeds, and vegetable oils, such as soybean, cottonseed, corn, sunflower, and safflower oil. While still considered healthier than saturated fat, research suggests that too much omega-6 in relation to omega-3 may lead to inflammatory diseases, including cardiovascular disease, diabetes, obesity, and rheumatoid arthritis. What's more, the amount of omega-6 fat that we tend to consume has increased dramatically in recent decades, while in general the amount of omega-3 fat we consume is lower. In general, foods with omega-3s are considered better for the body than foods with omega-6 fatty acids. In addition, most of us already get enough omega-6 in our diets. In addition to essential fatty acids, polyunsaturated fats are rich in vitamin E, an important antioxidant with many health benefits. Replacing saturated dietary fats with polyunsaturated fats can help reduce LDL-cholesterol levels, which in turn can lower your risk for heart disease. There has also been research suggesting that foods high in omega-3 fatty acids may reduce your risk for certain cancers including breast cancer and colorectal cancer. However, a large clinical trial found that consumption of omega-3 supplements did not provide these protective benefits. The National Institutes of Health notes that research results related to omega-3s and cancer have been inconsistent and vary by cancer site and other factors, including gender and genetic risk. Consumption of omega-3 is also associated with a reduced risk of developing age-related macular degeneration, dry eye disease, rheumatoid arthritis, Alzheimer’s disease, dementia, and other conditions. Research is ongoing to confirm these benefits and to determine if supplements can provide the same benefits as eating omega-3 foods. Consumption of foods high in omega-3 fatty acids has been associated with significant health benefits including a decreased risk of heart disease, cancer, and other conditions. It is unclear if taking omega-3 supplements can provide these benefits. While health experts aren't certain about the extent of the benefits they provide, most recommend replacing saturated fat with healthier polyunsaturated fat. Ways you can swap saturated fat for healthier polyunsaturated fats include sautéing vegetables in vegetable oil instead of butter, replacing one-third to one-half of the butter in baked goods with a vegetable oil such as canola oil, and adding nuts to salad instead of cheese. While most vegetable oils are healthy, they can sometimes go bad. Polyunsaturated cooking oils turn rancid more quickly than other fats. To prevent cooking oils from going rancid, store in a cool, dark place before opening, and refrigerate after opening. Before using an open bottle, check for rancidity by smelling and touching the oil. If it smells metallic, bitter, or soapy, or is sticky to the touch, don't use it. Fish like salmon and tuna can be a healthy addition to your diet. Not only do they boost your intake of polyunsaturated fat, but when they replace meat, they also reduce your intake of saturated fat. However, not all fish dishes are created equal. Try to enjoy your fish without breading or batter. And choose healthy preparation methods such as grilling or roasting instead of frying. If you consume snacks throughout the day, consider replacing starchy foods such as chips and crackers with healthier nuts and seeds. Not only do these plant-based foods provide better nutrition, but they are also likely to help you to feel full longer because of the protein and fiber they provide. One downside to polyunsaturated oils is they are used to create trans fats, which raise LDL cholesterol levels and lead to heart disease and diabetes. Trans fats are made in an industrial process that adds hydrogen to vegetable oil creating a more shelf-stable product. Prior to the 1990s, trans fats were considered a healthier alternative to saturated fats. Margarine, for example, is often made of trans fats and was promoted as a heart-healthy option to butter. Since the discovery that trans fats are bad, many margarine companies have reformulated their product to eliminate trans fats. To see if your food contains trans fats, read the nutrition labels. Trans fats are separated under the total fat heading. In ingredient lists, the term "partially hydrogenated" before an oil indicates it is a trans fat. Patterson E, et al. Health implications of high dietary omega-6 polyunsaturated Fatty acids. J Nutr Metab. 2012;2012:539426. doi: 10.1155/2012/539426.